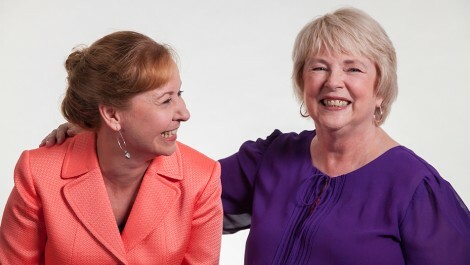 Karen, left, and Joyce Koch are new rivals to the right-wing billionaire Koch brothers. You’ve probably heard of the Koch brothers – right-wing billionaires who buy elections and peddle influence to further their business interests. Now it’s time to meet the Koch sisters. They’re not related to each other, or to Charles and David Koch. Joyce and Karen Koch are just two everyday Americans who care about people before profits. “We’re just two average women who’ve raised families and worked hard all our lives,” says Karen Koch in a recent ad launched by the AFL-CIO. “We don’t have billions to spend on political campaigns,” adds Joyce Koch. Karen is a university professor and a member of the Michigan Education Association. Joyce is a retired social worker and the wife of a retired teacher and American Federation of Teachers member. They embody millions of working Americans who want a voice, but don’t have the deep pockets of the Koch brothers. Instead of fighting for corporate profits, the Koch sisters stand for fair wages and protecting Social Security. Learn more about the Koch Sisters. Are you a Koch Sister, too?